​The Architectural Treasures of the Indiana State Library: The only guide to one of the most beautiful buildings in Indiana, as well as one of its best kept secrets! This 120-pg, pocket-sized guidebook is heavily illustrated and packed with the history, stories, and secrets of this classic building. German Cooking – Hoosier Style: Despite what you may have seen or heard, not all Germans wear lederhosen and dine exclusively on wurst, sauerkraut, and dumplings. The latest publication of IGHS features over a hundred recipes, both traditional and modern. Operation Vittles: This delightful cookbook was compiled by the American Women in Blockade Berlin during the 1949 Berlin Airlift. This reprint edition features a new forward by Col. (Ret) Jorg Stachel who experienced the blockade as a ten-year-old boy. ​Sommerfrüchte (Summer fruits from an American monastery garden or the Convent of the Benedictine Sisters of the Immaculate Conception at Ferdinand, Dubois County, IN, USA). 1898 / translated by Eberhard and Ruth Reichmann. Hofmann, Annette American Turner Movement: A History from its Beginnings. IUPUI Max Kade German-American Center and Indiana German Heritage Society, 2010. 276 pp. Adams, Willi Paul. The German-Americans. An Ethnic Experience. American edition by LaVern J. Rippley & Eberhard Reichmann. IGHS, 1993. 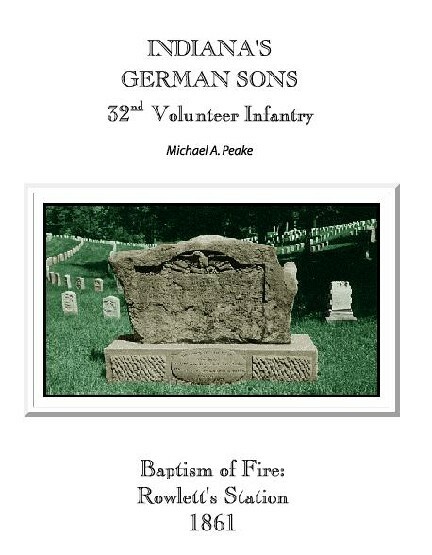 46pp., ill.
Fifty Years of Unrelenting German Aspirations in Indianapolis, 1848-1898. (Theodore Stempfel's 1898 Festschrift) Bilingual edition by G.R. Hoyt et al (eds. ); IGHS, 1991. 158pp., 9x12 format, ill., index. Peake, Michael A.Indiana's German Sons. 32nd Volunteer Infantry - Baptism of Fire: Rowlett's Station 1861 IGHS, 2000. 72pp., ill.
Reichmann, Eberhard and LaVern J. Rippley, Joerg Nagler (eds.) Emigration and Settlement Patterns of German Communities in North America (1995), 414pp. ​Rippley, La Vern J. The Columbus Germans. (1998). [Columbus, OH]. Reprint edition, 52pp., ill.
Robinson, Gabrielle and Erwin Scherer. Life in Letters: a 19th Century correspondence between Bavaria and South Bend, Indiana. IGHS, 2006. 178pp., ill.
Selm, William L. Wegweiser: A self-guided tour of German-American Sites in Indianapolis. IGHS, 2008. 55p., ill.
Tolzmann, Don Heinrich (ed.). New Ulm in Word and Picture. J.H. Strasser's History of a German-American Settlement. Orig. publ. 1892. IGHS, 1997. 90pp., ill.
​Tolzmann, Don Heinrich (ed. ).The German-American Forty-Eighters, 1848-1998. IGHS, 1998. 127pp., ill., index. ​Tolzmann, Don Heinrich (ed.). The Sioux Uprising in Minnesota, 1862: Capt. Jacob Nix's Eyewitness History. Bilingual edition. Orig. publ. 1891. Trans. by G. Steinhauser, D.H. Tolzmann and E. Reichmann. IGHS, 1994. 82pp., ill.
Witter's Deutsch-Englische Schreib- und Lese-Fibel / German-English Primer. Orig. publ. 1881. Reprint edition by Eberhard Reichmann. IGHS, 1987. 102pp., ill.
​Ziegler, James P. The German-Language Press in Indiana: a bibliography. IGHS, 1994. 70pp., ill., index.